The perfect size for a fun but challenging puzzle. 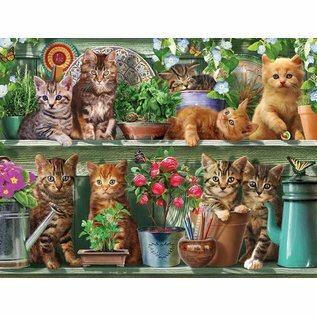 These 300 piece puzzles have extra large pieces for easy seeing and handling. Made in New Hampshire. Cozy Cottage: EZ Grip puzzles, with their extra large, sturdy pieces, make putting a puzzle together easier for smaller hands or those whose hands are painful or tire easily. Cozy Cottage features a colorful, peaceful scene. 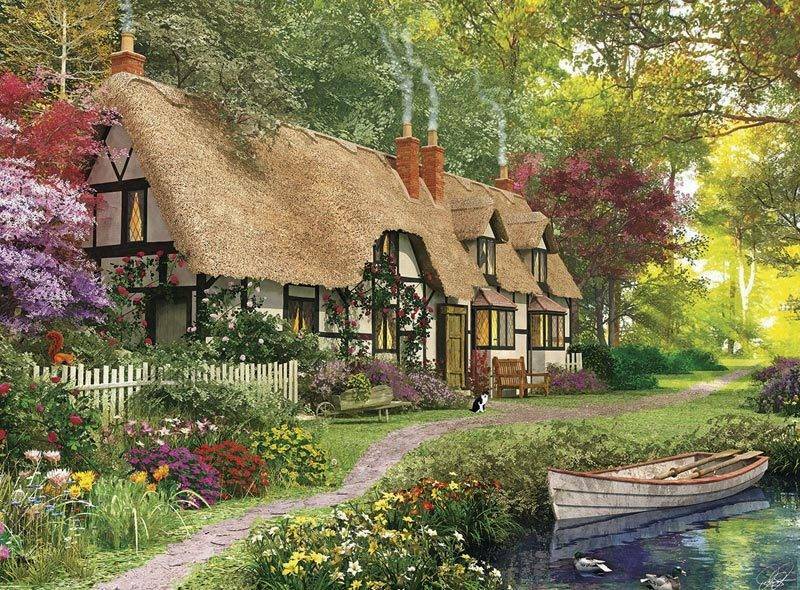 The inviting and cozy cottage features half-timbers, a thatched roof, and smoke rising from multiple chimneys. The colorful garden, picket fence, rowboat, and the way the light plays off the trees in the distance complete this EZ Grip puzzle's charm. 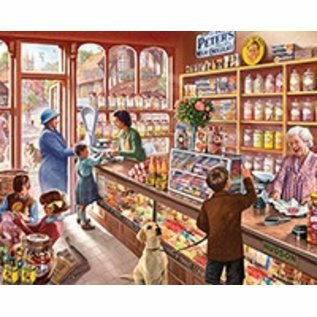 300 piece EZ Grip jigsaw puzzle: Finished size 18" X 24". 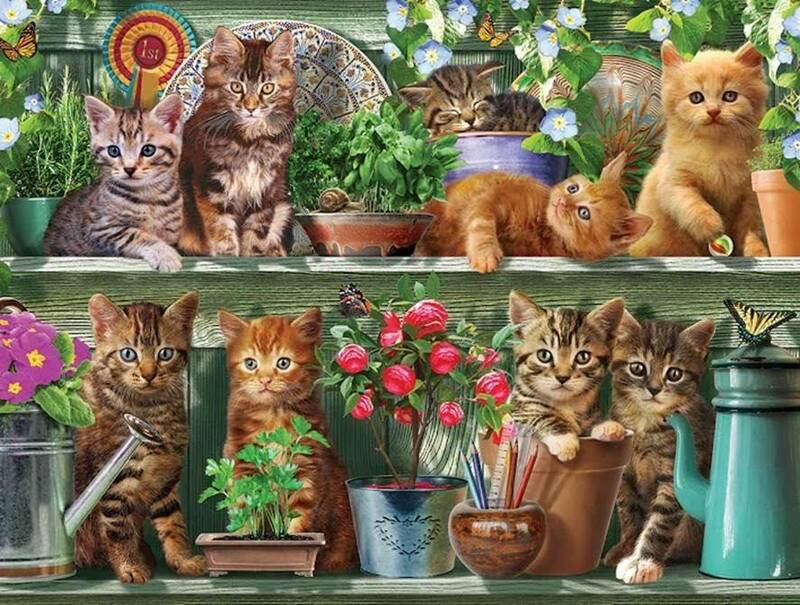 Kitties: An absolutely adorable litter of kittens, mostly tiger-striped, peek at us from shelves filled with house plants and some decorative crockery. Hope nothing gets knocked off onto the floor! 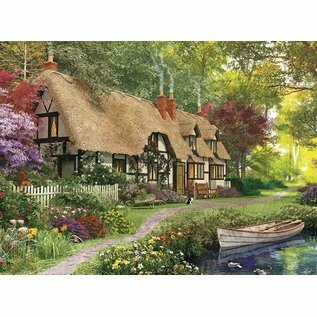 English artist Adrian Chesterman has created this colorful view on a 300 piece puzzle with extra large, easy-grip pieces. 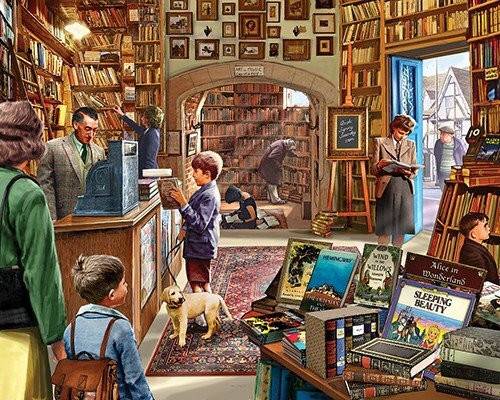 Cozy Book Shop: features a nostalgic scene from an English Village by artist Steve Crisp. What better way to spend an afternoon than in a comfortable old bookstore with sagging shelves and good company? 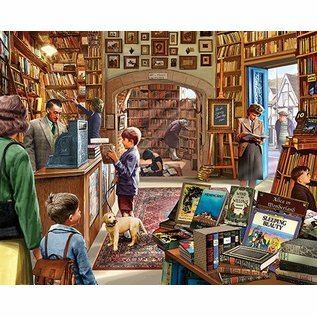 Classic titles are piled wherever there's room in this jigsaw, and there's even a sign in the puzzle that there will be a book signing come Saturday - dogs welcome! 300 piece jigsaw puzzle. 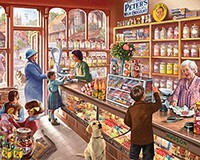 Cozy Candy Shop: Old Candy Store features a nostalgic view with a distinctly English flavor, with "biccies" and sweets by the pound among the temptations offered by the kindly candy store proprietress and her assistant. The open door offers glimpses of the village architecture, street life and beloved dog population. 300 pieces by artist Steve Crisp. "In 1978, two entrepreneurs in New Hampshire started a small poster company that evolved into White Mountain Puzzles. White Mountain Puzzles grew more gradually and is still a family owned business. Founders Cronan Minton and Ted Wroblewski are still involved but have turned over the day to day operations and ownership to their respective sons, Sean and Colin. Ted and Cronan are proud that White Mountain Puzzles has grown into one of the top puzzle brands in the United States! White Mountain Puzzles is still located in Jackson, NH (pop. 850), in the White Mountain National Forest, just a few minutes from Mount Washington (elevation 6280 feet), in a beautiful village dotted with turn-of-the-century inns and B&Bs"